Indian science of eclipses is different that rest of the world. We believe that an eclipse is caused when Rahu and Ketu, the two invisible planets, swallow either the sun or the moon depending upon the time of the year. An eclipse in Sanskrit is called grahanam. Life on the day of the eclipse is very different than other days. Hindus bathe in the Ganges or the sea as soon as the eclipse begins. They will stand up in the water and chant Krishna Mahamantra till the eclipse lasts. 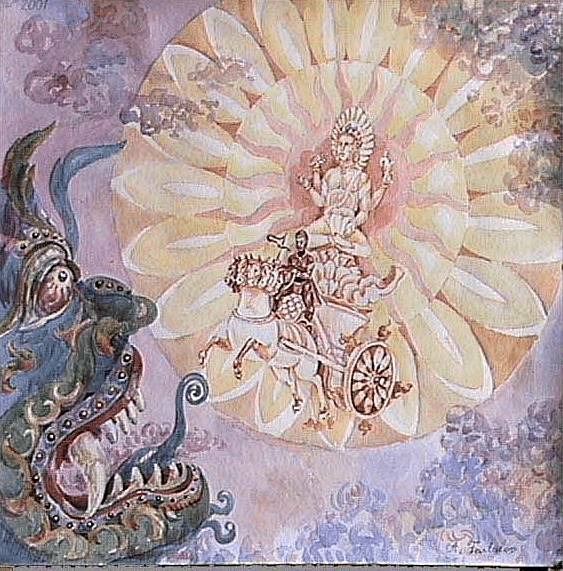 (Sri Chaitanya-charitamrita, Adi-lila 13.124. purport.) This is mandatory even if News services warn you against it since the tides will be high. 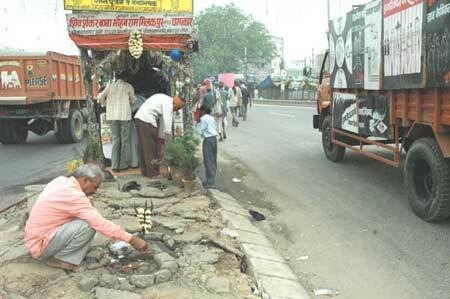 In the middle of a four-lane highway under a peepal tree sits a temple of Kali, goddess of destruction. Nine in the morning, in the crowd of office goers, bullock carts are in a rush to reach the mandi. Camels, elephants, cows, buffaloes, and hens all feel at home here. People get up, do their morning rituals, have tea, and talk to friends. Indian roads for a long time have been better suited for life than motor cars.